Elementary students have difficulty to visualize chemistry concepts on a molecular level and there is a disconnect in the current tools in the market to address this problem. I conducted qualitative research by interviewing 12 students and 5 teachers and my research proved that static prints don’t work for these students and it gets time consuming for the teachers while teaching a concept. Currently students learn chemistry concepts such as structure of atoms ,periodic table through textbooks or online animation videos. I am confident that my concept is unique and does not have direct competitors. There are apps available on the app store such as Bju’s learning app for teaching kids chemistry concepts. Block AR game available on the internet is a good augmented reality competition. 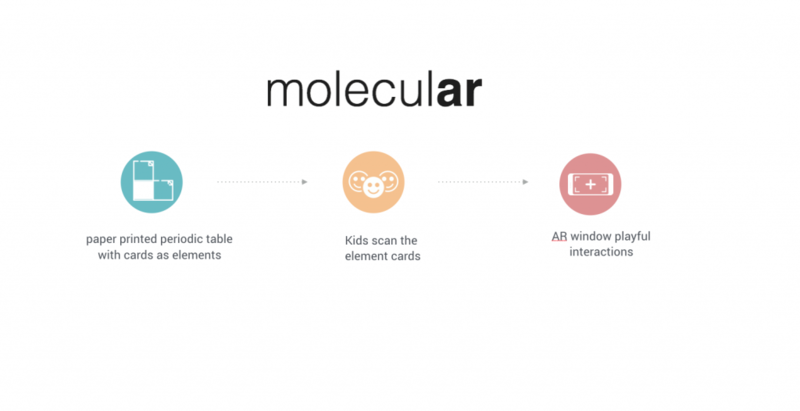 MoleculAR will be unique as there will paper printed periodic table with cards as elements and Augmented reality will work as a magic window that converts the paper printed periodic table into other wordly playful interactions. The kids will learn about chemistry concepts such as periodic table, electronic configuration of an element, covalent bonds and chemical reactions through this application. This will be an immersive interactive playful experience. I believe that this app has great potential and can be a great learning resource. I believe it will be available on the internet for a of 5-10$ fee as the kit will come with a printed periodic table with removable cards.